We LOVE these! They are so delicious! Even Little Monkey hopes and begs for leftovers! – Cheese, you can put a little cheese inside each enchilada or just sprinkle it on top, whatever you prefer. – Lightly spray or butter a 9×13″ pan and preheat the oven to 350F. – Open your can of Enchilada Sauce and pour a thin layer into the bottom of the greased pan. – Thaw and dice the chicken breast. Pre-cook, if desired. – Open and drain your can of beans. Rinse well. – Dice tomatoes, avocados, and green onions. – Lay out a tortilla. Cut two slices of cream cheese off the block and lay them on the tortilla. 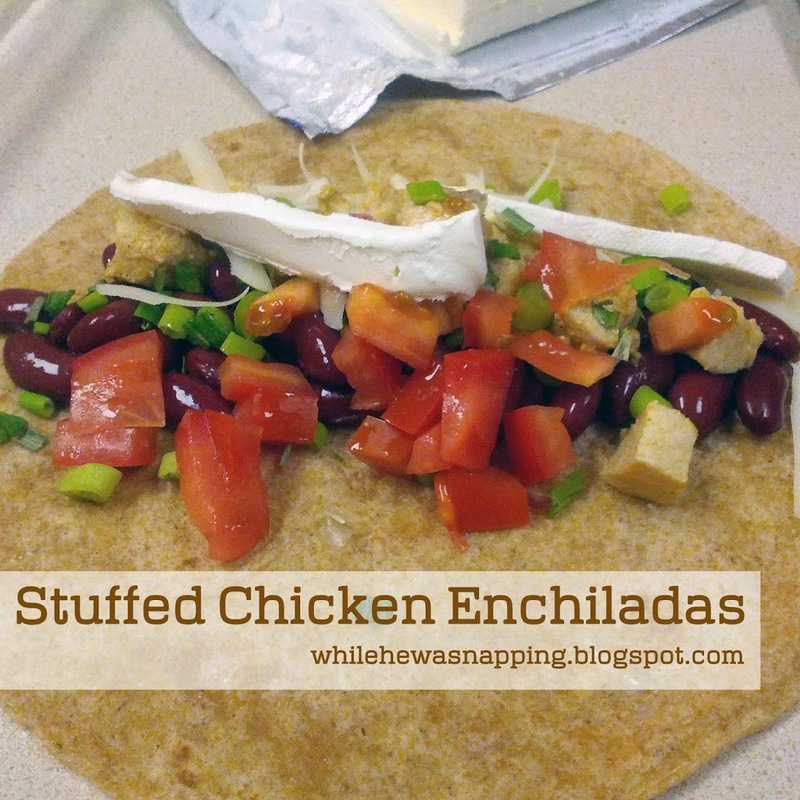 – Fill your tortilla with beans, chicken, avocado, tomatoes, green onions and cheese. – Roll up the tortilla and place in the 9×13″ pan. – Repeat with remaining tortillas until your pan is full. I can usually get 6-8 tortillas in a pan. – Sprinkle cheese over the top of the tortillas generously. – Bake at 350F for 25-35 mins or until cheese is melted and light golden brown. Serve and Enjoy! IT WILL BE HOT!! And DELICIOUS! We love chicken here so I’m sure this recipe would be a hit! !